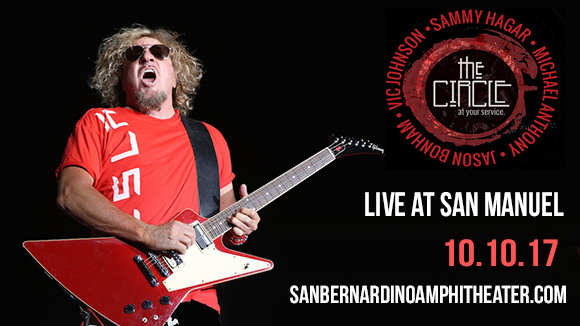 Sammy Hagar often referred to as Red Rocker is once again taking to the North America stages to bring fans a night of nothing but the biggest and best hits… With his incredible band The Circle, Sammy Hagar continues to make history! Since his very first debut to the modern day of 2017, now after traveling through the eras, collecting anthems along the way – Sammy Hagar has an incredible collection of music under his belt! Prepare to be blown away at San Manuel Amphitheater on Sunday 10th September 2017!! Like most long-standing Rock artists in the present day, Sammy Hagar and friends are forming a show like you've never seen before, re-forming some of the greatest legendary vocalists, guitarists, drummers and bass players of our time. The Circle celebrates a vast collection of sounds from the careers of Led Zeppelin and Van Halen. A match made in heaven when fused together, there's no one ego bigger than the other here… this is about giving it your all and dedication to the history of music! On lead vocals for this insanely good project, is of course, Sammy Hagar. Known best for his hard hitting sound in Montrose and then fast forwarding to a solo career, where he smashed the charts throughout the 1980's with singles such as "I Can't Drive 55." It's a challenge to find anyone that doesn't know of him… and this is all before the groundbreaking Van Halen! Hagar became the lead man in 1985 – 1996. For all of his unforgettable work, he was inducted into the Rock and Roll Hall of Fame – a well deserved credit!